Uber's new CEO can't arrive soon enough. Uber said Wednesday its sales hit $1.75 billion in the second quarter, up 17% from the prior quarter. And it trimmed its losses. But Uber still lost a lot of money -- $645 million in the three months that ended in June. That is a staggering amount by almost any standard. Axios was first to report the financial results. Uber released the financial results following reports that several mutual funds had marked down the value of their stakes in the company this year amid a wave of PR crises. Vanguard and Hartford Funds each marked down their investments in Uber by 15% in the quarter ending June 30, according to public filings. T. Rowe Price revised the value of its Uber stake down about 12% for the same period. The markdowns offer a rare glimpse into how Uber's value may be impacted by its ongoing struggles. As a privately held company, Uber is not traded on a public stock exchange, but mutual funds regularly disclose their holdings, including estimates for startups they've backed. Mutual funds typically factor in a company's financial performance, business actions and the performance of similar publicly traded businesses. And not all funds agree. Fidelity, for example, has left its estimate of Uber's value effectively unchanged. Vanguard, Fidelity and T. Rowe Price declined to comment on their specific reasons. Hartford Funds did not immediately respond. Uber declined to comment for this story. The markdowns and steep losses are more reminders of the urgency for Uber to bring in new leadership as well as a reminder of the enormity of the challenge that new leadership will face. 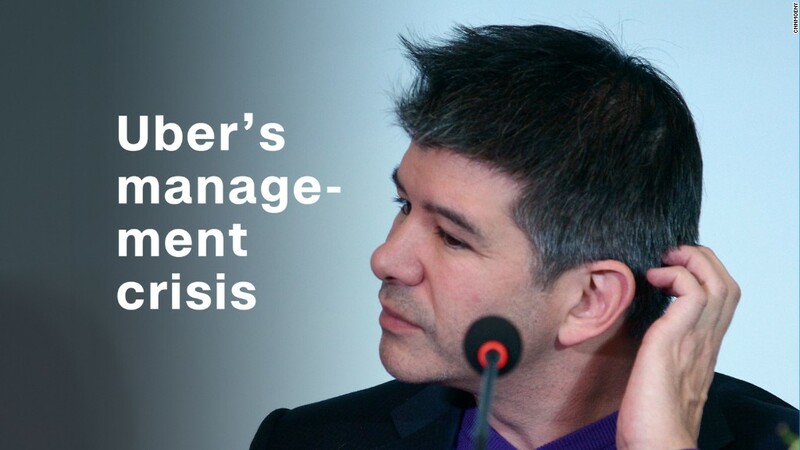 It has now been 64 days since Travis Kalanick resigned as CEO following a months-long investigation into the company's office culture. And the list of problems only seems to be growing. Uber now has no CEO, CFO, COO, CMO or president. Other top employees, including its first employee and SVP of global operations, have also stepped down in the months since Kalanick's departure. As Uber stumbles, its rivals abroad are raising billions in funding and working together to dominate their respective markets. At home, Uber faces what could be an escalating -- and potentially existential -- courtroom battle with Google's Waymo over stolen self-driving car technology. Benchmark, an early Uber investor, sued Kalanick this month in an effort to get him off the board. Among other allegations, Benchmark accused Kalanick of trying to "acquire the power to pack the Board to facilitate his desired re-appointment as Uber's CEO." Other Uber investors have lashed out at Benchmark for the lawsuit and tried to get the firm to forfeit its board seat. Now a board at war with itself must come together to pick a CEO to save the company. The list is rumored to be down to three candidates, with General Electric's outgoing CEO Jeff Immelt at the top. But Benchmark is reportedly still pushing for HP CEO Meg Whitman to get the job. There's just one small problem: Meg Whitman has already said that "Uber's CEO will not be Meg Whitman."